The Australian Institute of Criminology estimates fraud costs the economy more than $8.5 billion a year. The seriousness of the global fraud problem is the reason why Pilot supports International Fraud Awareness Week. Held from 15 to 22 November, ‘Fraud Week’ champions the need to proactively fight fraud. Fraud week examines ways to strengthen fraud detection, investigation and prevention capabilities. Falsely recording one partner’s personal expenses as those of another. SME fraud is enabled by lax business controls. One employee should not initiate, approve and record a transaction in the books, deal with assets, reconcile accounts and review accounting reports. However, this situation is sometimes unavoidable when employee resources are limited. 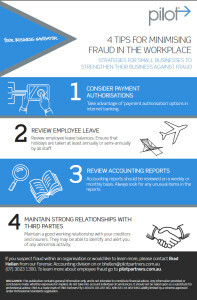 For some tips on how to minimise employee fraud, click to download this quick and easy to read infograph. 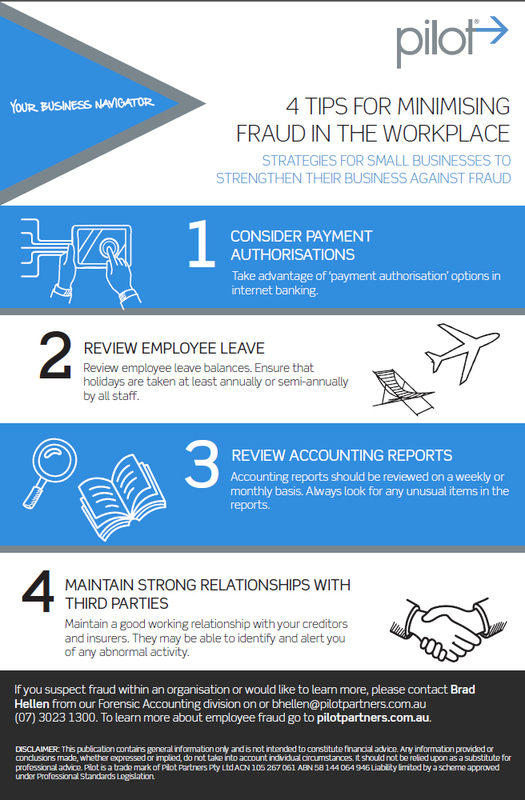 These strategies will be helpful for any SME trying to strengthen their business against workplace fraud. If you suspect fraud within an organisation or would like to learn more, please contact Brad Hellen from our Forensic Accounting division.